For the possible dwarf planet, see 20000 Varuna. For other uses, see Varuna (disambiguation). Varuna (/ˈvɜːrʊnə, ˈvɑːrə-/; Sanskrit: वरुण, IAST: Varuṇa, Malay: Baruna) is a Vedic deity associated initially with the sky, later also with the seas as well as Ṛta (justice) and Satya (truth). He is found in the oldest layer of Vedic literature of Hinduism, such as hymn 7.86 of the Rigveda. He is also mentioned in the Tamil grammar work Tolkāppiyam, as the god of sea and rain. Agni, Vayu, Indra, Samudra, etc. 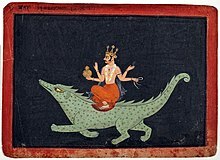 In the Hindu Puranas, Varuna is the god of oceans, his vehicle is a Makara (part fish, part land creature) and his weapon is a Pasha (noose, rope loop). He is the guardian deity of the western direction. In some texts, he is the father of the Vedic sage Vasishtha. Varuna is found in Japanese Buddhist mythology as Suiten. He is also found in Jainism..
Varuna iconography at the 11th-century Rajarani Hindu temple. The theonym Varuṇa is a derivation from the verbal vṛ ("to surround, to cover" or "to restrain, bind") by means of a suffigal -uṇa-, for an interpretation of the name as "he who covers or binds", in reference to the cosmological ocean or river encircling the world, but also in reference to the "binding" by universal law or Ṛta . Georges Dumézil (1934) made a cautious case for the identity of Varuna and the Greek god Ouranos at the earliest Indo-European cultural level. The etymological identification of the name Ouranos with the Sanskrit Varuṇa is based in the derivation of both names from the PIE root *ŭer with a sense of "binding" – the Indic king-god Varuṇa binds the wicked, the Greek king-god Ouranos binds the Cyclopes. While the derivation of the name Varuṇa from this root is undisputed, this derivation of the Greek name is now widely rejected in favour of derivation from the root *wers- "to moisten, drip" (Sanskrit vṛṣ "to rain, pour"). You at your birth are Varuna, O Agni. When you are kindled, you are Mitra. In you, O son of strength, all gods are centered. You are Indra to the mortal who brings oblation. the mysterious names of maidens, O Self-sustainer. Varuna and Mitra are the gods of the societal affairs including the oath, and are often twinned Mitra-Varuna. Both Mitra and Varuna are classified as Asuras in the Rigveda (e.g. RV 5.63.3), although they are also addressed as Devas as well (e.g. RV 7.60.12). Varuna, being the king of the Asuras, was adopted or made the change to a Deva after the structuring of the primordial cosmos, imposed by Indra after he defeats Vrtra. Varuna with Varunani. Statue carved out of basalt, dates back to 8th century CE, discovered in Karnataka. On display at the Prince of Wales museum, Mumbai. According to Doris Srinivasan, a professor of Indology focusing on religion, Varuna-Mitra pair is an ambiguous deity just like Rudra-Shiva pair. Both have wrathful-gracious aspects in Indian mythology. Both Varuna and Rudra are synonymous with "all comprehensive sight, knowledge", both were the guardian deity of the north in the Vedic texts (Varuna later gets associated with west), both can be offered "injured, ill offerings", all of which suggest that Varuna may have been conceptually overlapping with Rudra. Further, the Rigvedic hymn 5.70 calls Mitra-Varuna pair as rudra, states Srinivasan. According to Samuel Macey and other scholars, Varuna had been the more ancient Indo-Aryan deity in 2nd millennium BCE, who gave way to Rudra in the Hindu pantheon, and Rudra-Shiva became both "timeless and the god of time". In Vajasaneyi Samhita 21.40 (Yajurveda), Varuna is called the patron deity of physicians, one who has "a hundred, a thousand remedies". His capacity and association with "all comprehensive knowledge" is also found in the Atharvaveda (~1000 BCE). Varuna also finds a mention in the early Upanishads, where his role evolves. In verse 3.9.26 of the Brihadaranyaka Upanishad (~800 BCE), for example, he is stated to be the god of the western quarter, but one who is founded on "water" and dependent ultimately on "the heart" and the fire of soul. In the Katha Upanishad, Aditi is identified to be same as the goddess earth. She is stated in the Vedic texts to be the mother of Varuna and Mitra along with other Vedic gods, and in later Hindu mythology she as mother earth is stated to be mother of all gods. Varuna himself arose from the depth of the ocean and begged Rama for forgiveness. Rama interacts with Varuna in the Hindu epic Ramayana. For example, faced with the dilemma of how to cross the ocean to Lanka, where his abducted wife Sita is held captive by the demon king Ravana, Rama (an Avatar of Vishnu) performs a pravpavesha (prayer, tapasya) to Varuna, the Lord of Oceans, for three days and three nights, states Ramesh Menon. Varuna does not respond, and Rama arises on the fourth morning, enraged. He states to his brother Lakshamana that "even lords of the elements listen only to violence, Varuna does not respect gentleness, and peaceful prayers go unheard". With his bow and arrow, Rama prepares to attack the oceans to burn up the waters and create a bed of sand for his army of monkeys to cross and thus confront Ravana. Lakshmana appeals to Rama, translates Menon, that he should return to "peaceful paths of our fathers, you can win this war without laying waste the sea". Rama shoots his weapon sending the ocean into flames. As Rama increases the ferocity of his weapons, Varuna arises out of the oceans. He bows to Rama, stating that he himself did not know how to help Rama because the sea is deep, vast and he cannot change the nature of sea. Varuna asked Rama to remember that he is "the soul of peace and love, wrath does not suit him". Varuna promised to Rama that he will not disturb him or his army as they build a bridge and cross over to Lanka. The Tolkāppiyam, a Tamil grammar work from 3rd century BCE divides the people of ancient Tamilakam into 5 Sangam landscape divisions: kurinji, mullai, paalai, marutham and neithal. Each landscape are designated with different gods. Neithal is described as a seashore landscape occupied by fishermen and seatraders, with the god of sea and rain, Varunan or Kadalōn. "Varuna" means water which donates the ocean in the Tamil language. Jhulelal is considered an incarnation of Varuna by Sindhi Hindus. Jhulelal is believed by Sindhi Hindus to be an incarnation of Varuna. They celebrate the festival of Cheti Chand in his honor. The festival marks the arrival of spring and harvest, but in Sindhi community it also marks the mythical birth of Uderolal in year 1007, after they prayed to Hindu god Varuna to save them from the persecution by tyrannical Muslim ruler named Mirkhshah. Uderolal morphed into a warrior and old man who preached and reprimanded Mirkhshah that Muslims and Hindus deserve the same religious freedoms. He, as Jhulelal, became the champion of the people in Sindh, from both religions. Among his Sufi Muslim followers, Jhulelal is known as "Khwaja Khizir" or "Sheikh Tahit" both refer of Lal Shahbaz Qalandar. The Hindu Sindhi, according to this legend, celebrate the new year as Uderolal's birthday. The Pali Canon of the Theravada school recognizes Varuṇa (Sanskrit; Pali: Varuna) as a king of the devas and companion of Sakka, Pajāpati and Isāna. In the battle against the Asuras, the devas of Tāvatiṃsa were asked to look upon the banner of Varuna in order to have all their fears dispelled (S.i.219). The Tevijja Sutta mentions him among Indra, Soma, Isāna, Pajāpati, Yama and Mahiddhi as gods that are invoked by the brahmins. The Ātānātiya Sutta lists him among the Yakkha chiefs. Buddhaghosa states (SA.i.262) that Varuna is equal in age and glory (vanna) with Sakka and takes the third seat in the assembly of devas. In East Asian Buddhism, Varuna is a dharmapāla and often classed as one of the Twelve Devas (Japanese: Jūniten, 十二天). He presides over the western direction. In Japan, he is called "Suiten" (水天 lit. "water deva"). He is included with the other eleven devas, which include Taishakuten (Śakra/Indra), Fūten(Vāyu), Enmaten (Yama), Rasetsuten (Nirṛti/Rākṣasa), Ishanaten (Īśāna), Bishamonten (Vaiśravaṇa/Kubera), Katen (Agni) Bonten (Brahmā), Jiten (Pṛthivī), Nitten (Sūrya/Āditya), and Gatten (Candra). Suitengū (Tokyo) is a Shinto shrine to Varuna. Varuna is also worshipped in Japan's Shinto religion. One of the Shinto shrines dedicated to him is the Suitengū ("Palace of Suiten") in Tokyo. After the Japanese emperor issued the Shinbutsu bunri, the separation of Shinto and Buddhist practices as part of the Meiji Restoration, Varuna/Suiten was identified with the Japanese supreme God, Amenominakanushi. Right: Vishnu avatar Parasurama, asking Varuna to create Kerala. ^ "Varuna". Random House Webster's Unabridged Dictionary. ^ a b c George Mason Williams (2003). Handbook of Hindu Mythology. ABC-CLIO. p. 294. ISBN 978-1-57607-106-9. ^ a b c James G. Lochtefeld (2002). The Illustrated Encyclopedia of Hinduism: N-Z. The Rosen Publishing Group. p. 741. ISBN 978-0-8239-3180-4. ^ a b Journal of Tamil Studies. International Institute of Tamil Studies. 1969. p. 131. ^ a b c d Adrian Snodgrass (1992). The Symbolism of the Stupa. Motilal Banarsidass. pp. 120–122 with footnotes. ISBN 978-81-208-0781-5. ^ Sehdev Kumar (2001). A Thousand Petalled Lotus: Jain Temples of Rajasthan : Architecture & Iconography. Abhinav Publications. p. 18. ISBN 978-81-7017-348-9. ^ Kristi L. Wiley (2009). The A to Z of Jainism. Scarecrow. p. 248. ISBN 978-0-8108-6821-2. ^ George Michell (1977). The Hindu Temple: An Introduction to Its Meaning and Forms. University of Chicago Press. pp. 4, 44–45 with Figure 15. ISBN 978-0-226-53230-1. ^ Dumézil, Ouranós-Váruna: Étude de mythologie comparée indo-européenne (Paris:Maisonneuve 1932). ^ Georges Dumézil, Ouranos-Varuna – Essai de mythologie comparée indo-européenne (Paris: G.-P. Maisonneuve, 1934). ^ Manfred Mayrhofer, Etymologisches Wörterbuch des Altindoarischen, vol. 2, s.v. "Váruṇa" (Heidelberg: Carl Winter, 1996), 515–6. Edgar C. Polomé, "Binder-god", in Encyclopedia of Indo-European Culture (London–Chicago: Fitzroy Dearborn, 1997), 65. ^ a b Mariasusai Dhavamony (1982). Classical Hinduism. Gregorian. pp. 167–168 with footnotes. ISBN 978-88-7652-482-0. ^ John Gwyn Griffiths (1991). The Divine Verdict: A Study of Divine Judgement in the Ancient Religions. BRILL. pp. 132–133. ISBN 90-04-09231-5. ^ Hermann Oldenberg (1988). The Religion of the Veda. Motilal Banarsidass. p. 104. ISBN 978-81-208-0392-3. ^ a b Hermann Oldenberg (1988). The Religion of the Veda. Motilal Banarsidass. p. 51. ISBN 978-81-208-0392-3. ^ Moriz Winternitz (1996). A History of Indian Literature. Motilal Banarsidass. pp. 91–92. ISBN 978-81-208-0264-3. ^ Hermann Oldenberg (1988). The Religion of the Veda. Motilal Banarsidass. pp. 95–98. ISBN 978-81-208-0392-3. ^ David Leeming (2005). The Oxford Companion to World Mythology. Oxford University Press. p. 200. ISBN 978-0-19-028888-4. ^ Bane, Theresa (2012). Encyclopedia of Demons in World Religions and Cultures. Jefferson, North Carolina: McFarland. p. 323. ISBN 978-0-7864-8894-0. OCLC 774276733. Retrieved 2018-12-06. ^ a b c d Doris Srinivasan (1997). Many Heads, Arms, and Eyes: Origin, Meaning, and Form of Multiplicity in Indian Art. BRILL Academic. pp. 48–49. ISBN 90-04-10758-4. ^ a b Samuel L. Macey (2010). Patriarchs of Time. University of Georgia Press. pp. 2–3, 165. ISBN 978-0-8203-3797-5. ^ J. P. Mallory; D. Q. Adams (2006). The Oxford Introduction to Proto-Indo-European and the Proto-Indo-European World. Oxford University Press. pp. 430–432. ISBN 978-0-19-928791-8. ^ Srinivasan, Doris (1978). "The Religious Significance of Divine Multiple Body Parts in the Atharva Veda". Numen. Brill Academic Publishers. 25 (3): 198–200, context: 193–225. doi:10.1163/156852778x00245. ^ The Early Upanishads: Annotated Text and Translation. Oxford University Press. 1998. pp. 98–101. ISBN 978-0-19-535242-9. ^ The Early Upanishads: Annotated Text and Translation. Oxford University Press. 1998. p. 478. ISBN 978-0-19-535242-9. ^ Arthur Anthony Macdonell (1898). Vedic Mythology. Motilal Banarsidass. pp. 120–124, 30–34, 45–46. ISBN 978-81-208-1113-3. ^ Pandey, R. Yajurveda. Diamond Pocket Books (P) Limited. p. 48. ISBN 978-81-288-2284-1. Retrieved 6 December 2018. ^ a b c d Ramesh Menon (2004). The Ramayana: A Modern Retelling of the Great Indian Epic. Macmillan. pp. 376–379. ISBN 978-1-4668-2625-0. ^ Bate, Bernard (2010-06-01). Tamil Oratory and the Dravidian Aesthetic: Democratic Practice in South India. Columbia University Press. p. 100. ISBN 978-0-231-51940-3. ^ Champakalakshmi, Radha (1996). Trade, ideology, and urbanization: South India 300 BC to AD 1300. Oxford University Press. p. 78. ^ Manickam, Valliappa Subramaniam; Nadu, Academy of Tamil Scholars of Tamil (1968). A glimpse of Tamilology. Academy of Tamil Scholars of Tamil Nadu. p. 174. ^ Roshen Dalal (2010). Hinduism: An Alphabetical Guide. Penguin Books India. p. 178. ISBN 978-0-14-341421-6. ^ a b Mark-Anthony Falzon (2004). Cosmopolitan Connections: The Sindhi Diaspora, 1860–2000. BRILL. pp. 58–60. ISBN 90-04-14008-5. ^ P. Pratap Kumar (2014). Contemporary Hinduism. Routledge. pp. 120–124. ISBN 978-1-317-54636-8. ^ a b c S. Ramey (2008). Hindu, Sufi, or Sikh: Contested Practices and Identifications of Sindhi Hindus in India and Beyond. Palgrave Macmillan. pp. 8, 36. ISBN 978-0-230-61622-6. ^ "Varuna". Wisdom Library. Retrieved 2019-01-26.